Last week, Pacific Ridge alumnus Nick Allman stopped by campus to share his experience as a 2016 GOP National Convention Delegate. During Thursday's Community Life, Nick gave a brief history of the convention and the process of attending as a delegate. 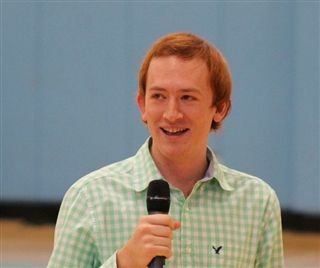 He explained how his youth and a bit of clever strategizing earned him a spot in the Texas delegation, then revealed some "behind-the-scenes" stories about parts of the convention that didn't make the news. However, Nick himself earned national news coverage several times during his four days in Cleveland. He was in the spotlight for successfully organizing a Republican National Convention Youth Caucus and for giving several interviews about the GOP millennial perspective on social issues. Nick also stopped by several American History classes to answer questions and encourage students to get involved in the political process.